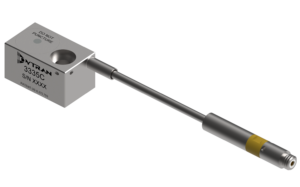 The Dytran model 3335C single axis charge mode accelerometer operates up to +649°C with allowable excursions to 700˚C. The model has 1-2 pC/g sensitivity with a 2500Hz upper-frequency range and is installed using a 10-32 mounting screw with a lock-wire hole for securing the sensor to the structure. It features an integral 10ft hard line cable with 10-32 connector designed to survive harsh environments and transmit a reliable signal to the data acquisition unit. The 3335C is case ground isolated, hermetically sealed and is only 24.4 x 14.5 x 13.3mm in size. Every aspect of this model is designed to provide high performance and long durability in the harshest high-temperature environments. Its base isolation, low mass, hermetically-sealed super alloy Inconel™ 600 housing and Dytran’s patented Silver Window™ technology make it ideal for use in high-temperature applications. In addition, the use of smaller piezoelectric crystals makes the assembly more robust and able to resist thermal shocks.